The EURJPY cross was treading water on Monday and was seen trading unchanged around 129.00 during the London session, with volatility minimal so far on the day. The German manufacturing PMI for August for revised slightly lower and printed 55.9, which was below 56.1 expected by analysts, while the euro zone’s PMI number stood at 54.6. The single currency failed to react on these numbers. Later in the day, Deutsche Bundesbank President Jens Weidmann is due to deliver a speech titled “Higher growth, lower inflation? – The digital transformation from the central bank” at the German Economic Association’s Annual Conference in Freiburg. This could influence the euro as Mr. Weidmann is one of the most serious candidates for the head of the ECB in 2019. 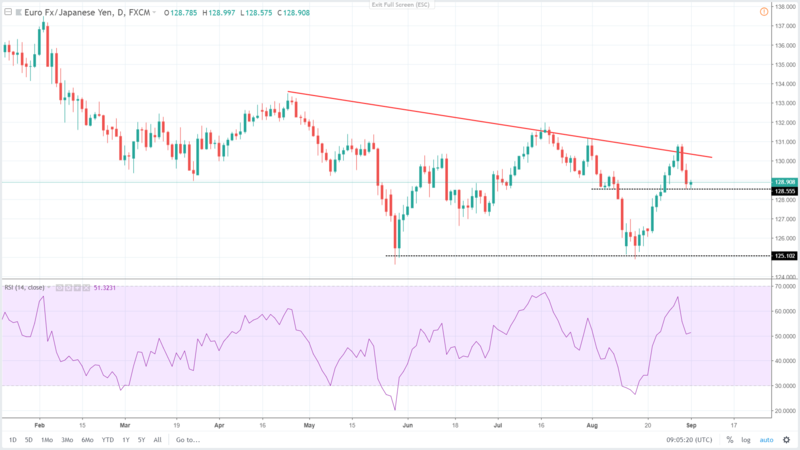 The recent rise of the EURJPY cross failed at the bearish trend line around 131.00 and declined notably from this level. Therefore, the first resistance for today is around 130.00, where the trend line is now and if broken, the euro could rise toward 131.00. The support is now at previous lows around 128.55 and as long as the cross trades above, the outlook could be in favor of bulls. On the other hand, should the support crack, further weakness below the 128 mark could occur.